GST Council met for the 34th time since its constitution yesterday (19th March, 2019) for taking crucial decisions on real estate sector. Taking forward the discussions and decisions of 33rd GST Council meeting dated 24.02.2019 GSTC has now taken important decisions in relation to levy of GST on real estate sector including manner of transition to new lower tax regime w.e.f. April 1, 2019. As already announced, GST on affordable housing shall be @ 1% and on other than affordable housing @ 5%. The ongoing projects will have an one-time option to continue under old scheme with ITC or switch over to new one without ITC. The time limit for transition will be discussed with states. However, reversal of ITC will have to be done in proportion to area or space. In the new scheme, 80% of the materials shall be procured from registered dealers except for capital goods, development rights, leases premium etc. This is a stringent condition as on shortfall of purchases from 80%, builders shall be liable to pay GST @ 18% under reverse charge mechanism. In case of cement purchased from unregistered supplier, GST shall be levied @ 28% under reverse charge method. Relief has also been granted to commercial apartments (shops, offices etc) in any residential project for lower GST rate of 5% where carpet area of such commercial space is not more than 15% of the total carpet area of all apartments. In case of Transfer of development rights, FSI and long term lease premium, burden of GST has been shifted to builder under reverse charge with time of supply to be determined on the basis of date of issue of completion certificate. The same time of supply would apply to JDA’s. 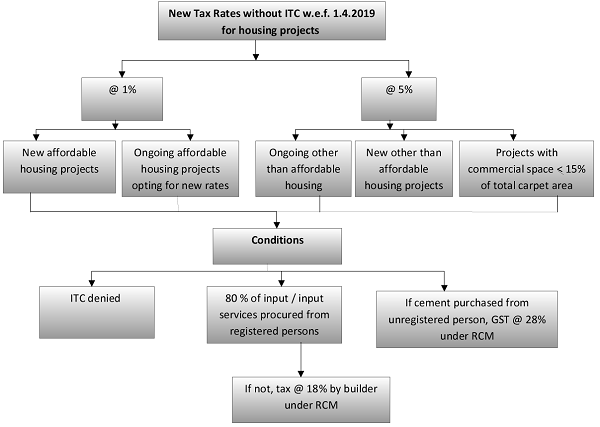 In case of input tax credit, ITC rules shall be amended to have clarity and provide procedure for monthly and final determination of ITC and its reversal for real estate projects. √ Under Construction projects as on 31st March, 2019 shall have an option to choose old rates (effective rate of 8% or 12% with ITC) with input tax credit or new rates without input tax credit. √ If the option is not exercised within the prescribed time limit then new rates shall apply. √ Atleast 80% of the material to be procured from registered dealers. Further, on shortfall of purchases from 80%, tax shall be paid by the builder @ 18% on RCM basis. √ However, Tax on cement purchased from unregistered person shall be paid @ 28% under RCM, and on capital goods under RCM at applicable rates. √ Input tax credit shall not be available. Under construction houses other than affordable houses presentlybooked prior to or after 01.04.2019. For houses booked prior to 01.04.2019, new rate shall be available on instalments payable on or after 01.04.2019. Commercial apartments having carpet area of not more than 15% of total carpet area of all apartments. √ Ongoing projects not been completed by 31.03.2019 shall transition the ITC in proportion to booking of the flat and invoicing done for the booked flat is available subject to a few safeguards. √ For mixed project transition of ITC shall be allowed on pro-rata basis in proportion to carpet area of the commercial portion. √ Supply of TDR, FSI, long term lease (premium) of land by a landowner to a developer shall be exempted with the condition constructed flats are sold before issuance of completion certificate and tax is paid on them. √ Exemption can be withdrawn (limited to 1% of value in case of affordable houses and 5% of value in case of other than affordable houses) if flats sold after issue of completion certificate. √ Builder shall be liable to pay tax on TDR, FSI, long term lease (premium) on the date of date of issue of completion certificate. Election Commission of India has announced the schedule for general elections in India, i.e., from 10th April, 2019 in seven phases with counting taking place on 23rd May, 2019. This also indicates that GSTC may now not be able to take major tax reforms and other tax friendly measures in view of the embargo of election code of conduct. There will now be no meeting till General Elections over except emergency issues. But if the case is like the carpet area is beyond the limits prescribed but the worth is less than the limit prescribed? … Say like the carpet area is 110 SQM and the worth of the flat is 40 Lacs in a metro area? What is the GST Rate that will be leived? what about resale property deals? In case of less than 80% purchases from registered dealers, the builder has to pay GST under reverse charge mechanism on shortfall amount or the entire procurement ?